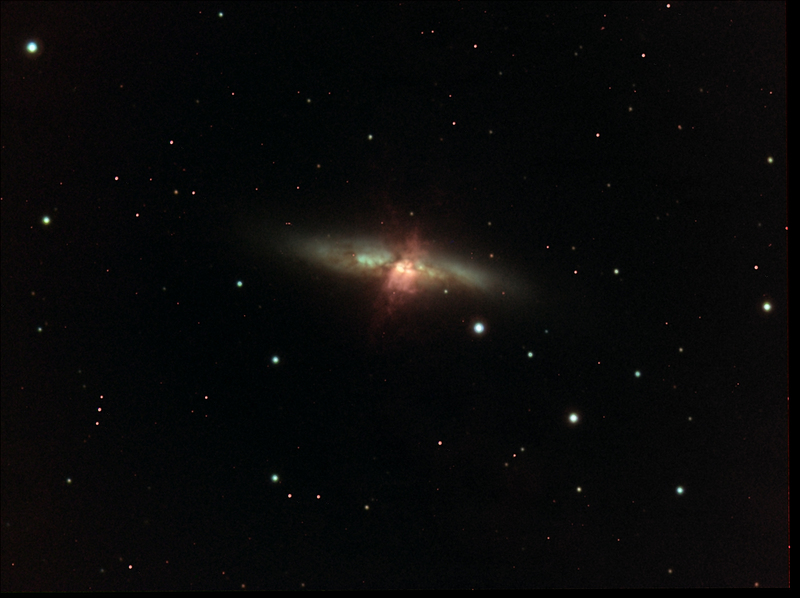 Messier 82 (also known as NGC 3034, Cigar Galaxy or M82) is the prototype nearby starburst galaxy about 12 million light-years away in the constellation Ursa Major. The starburst galaxy is five times as bright as the whole Milky Way and one hundred times as bright as our galaxy’s center. In 2005, the Hubble Space Telescope revealed 197 young massive clusters in the starburst core. The average mass of these clusters is around 2×105 M⊙, hence the starburst core is a very energetic and high-density environment. Throughout the galaxy’s center, young stars are being born 10 times faster than they are inside our entire Milky Way Galaxy.